September 4th marks a full moon and so I did a Full Moon Tarot Reading for myself that I wanted to share. If you've read my posts before, what's here for one is here for all. See what you get out of this post and how it relates to your life? Knight of Wands (energy as you enter the month) -- You are excited and ready for action as you prepare for what lies ahead. As you release the blocks in front of you and clear away old beliefs, you experience FLOW. It's beautiful and magical and oh so wonderful! It is an action-oriented, energetic, excitement you feel as you move forward with conviction and without fear. Isn't it so much more simple to just be who you are and do what you are here to do? You are living on purpose with confidence and enthusiasm. YES! 2 of Swords-reversed (overall theme of the month) -- This is a freeing energy. The things that were keeping you stuck are seen for what they are -- smoke and mirrors. So much is here for you as you FLOW. No longer are you bound by fear of judgment. The chains fall away from you now as you pull your energy together -- how powerful it is! Your decision and conviction to your path are apparent in everything you do. Being free allows you to go even deeper than ever before -- into yourself and into the mystical magic of the Divine. 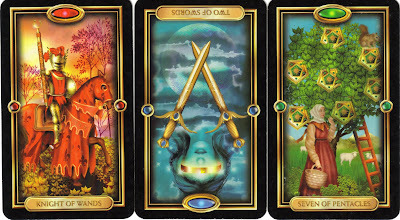 7 of Pentacles -- (energy as you end the month) -- Now is a time of vision and imagination. Without your blinders on, you can see so many possibilities in front of you. They are visionary AND practical. Here you allow your two gifts of vision and grounded-ness to blend and heighten the energy that surrounds you and the important work you are called to do. Continue to move forward, knowing that when you listen to the Divine, all truly is in order. Keep working consistently and faithfully. You are on track! I came away from the reading feeling so inspired and excited. How does this resonate with you? That's a pretty awesome-looking month you've got ahead of you! I wish I could say I am in the same place right now, but I'm not there yet. Maybe tonight's full moon will do its magic! Thanks for sharing! Sounds like this will be a fantastic month! I love the image of the chains falling away. Of course, they are always of my own making. "I release all that no longer serves me." That is AWESOME. I know I am excited and ready for motherhood as I enter this month and I hope the freeing energy is my 'mother's intuition' kicking in. I like the energy and excitement surrounding this next month! Thanks ladies for your comments and excitement about the new month. Mad Hatter -- I feel the full moon did is doing its magic for you. :) The energy of the Knight of Wands is very powerful..."releasing old blocks in front of you and clearing away old beliefs." Lavender Luz -- I love your affirmation. I'd like to try some PSYCH-K with you to see if your system fully believes this belief. If not, we could balance for it and re-write the software that holds this belief. Let me know and we'll do it next time we're together. Jamie D -- you have so many exciting things for you on your horizon. It will be an exciting adventure. And yes...I believe your mother's intuition will kick in on "high" soon enough...in fact, it probably has already started. I would love to take you up on your offer, Sheri. Thanks so much! !